GR Paddling gets a call from folks interested in kayaking near Grand Rapids but are unsure which tributary might make the best adventure. That's where Jeff Neumann comes in. "We've got 21 different reaches to pick from on five different rivers nine of them on the Grand River. Our reaches go in every direction, so some days the best river to take literally depends on which way the wind is blowing," said Neumann, whose GR Paddling is now in its fourth season. The business was created after local and state leaders worked consistently in recent decades to improve water quality on the Grand River. The elimination of combined sewers in Grand Rapids so stormwater runoff no longer overwhelms the city's sewer system has led to dramatically improved water quality, said Wendy Ogilvie, director of environmental programs for the Grand Valley Metropolitan Council. The environmental significance of the Grand River system, particularly its headwaters and upper tributaries, is critically important for both Lake Michigan and the entire Great Lakes region, said Carol Rose of the Michigan Wildlife Council, which recently launched a public education campaign highlighting the importance of managing the state's natural resources. "It features extensive wetlands, bogs and upland river systems," Rose said. "It also boasts diverse aquatic species and wildlife unique among Michigan's inland areas." The efforts to improve the Grand River's water quality are a shining example of the types of wildlife conservation and management that will ensure the state's forests, waters and wildlife are protected and preserved for generations to come, Rose said. GR Paddling isn't your typical kayak or canoe livery. "We provide experiences that begin when we pick you up at your house or hotel," Neumann said. "We have 38 different nature-based trip options to pick from, including our Moonlight Paddle, Paddle & Dine and Paddle & Picnic." GR Paddling even offers a Paddle & Propose trip. "We've had one couple so far who came from Chicago so he could propose to her. It was very cool," said Neumann, who retired from teaching electronics at Grand Rapids Community College to open GR Paddling with his wife, Rita, and their son, Mark. The natural beauty of the Grand River always amazes paddlers, Neumann says. Michigan's longest river at 252 miles, the Grand River's main stream rises near Jackson and flows north through Lansing and Ionia to Grand Rapids and to its outlet at Grand Haven on Lake Michigan. "People don't realize what a beautiful river it is," Ogilvie said. "They think the river is only the part you see in downtown Grand Rapids. But you get a mile either way, upstream or downstream from downtown, and it's a beautiful, forested river experience." 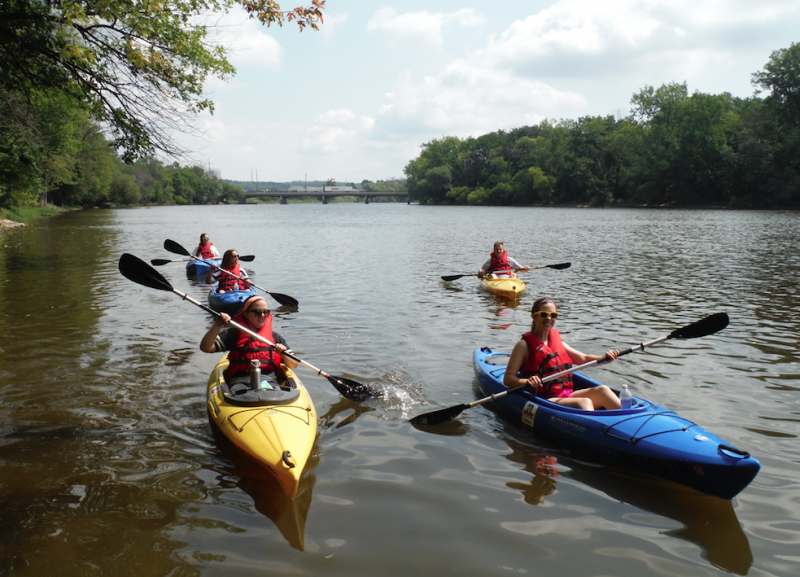 Paddling on Michigan tributaries like the Grand River can be life-changing for people who've never experienced nature in that way, said Rose of the Michigan Wildlife Council. The upper Grand River Watershed connects rural, upstream agricultural communities with sprawling suburban areas; diverse, industry-dotted urban zones; and Lake Michigan, notes the Grand River and Nature Discovery Learning Network. Getting out and paddling on a river or stream provides unique solitude that allows you to connect with Mother Nature, said Marc Miller, regional initiatives deputy for the Michigan Department of Natural Resources. "You get to slow down, you get to disconnect from your everyday life, and you get to experience something that's really natural and that connects us to our heritage," he said. Kayaking is an intimate way to see the river and the wildlife that call it home, Rose said. "All creatures need water to survive. So if there's a river nearby, there'll be wildlife: minks, otter, beaver, muskrats, ducks, deer, raccoons or a myriad of other animals," she said. "Kayaking is a great way to see wildlife from a completely different perspective." Knowing the importance of preserving and embracing our water resources, Michigan legislators in 2014 approved the Michigan Water Trail Program, and a websiteÂ was created to steer kayakers, canoeists and nonmotorized boaters to launches along various waterways. A Grand River Water Trail now in the planning stage is part of a greater emphasis the state is putting on water trails. Similar to bicycle or snowmobile trails, they often include signage for access and portage points, as well as information on local heritage, businesses and attractions. Water trails are another way to help people get out and experience all of Michigan's natural wonder. Matt Clouse, owner of Grand River Kayak and Canoe, says paddlers love to get away from it all but still be close to a big city such as Grand Rapids. "They really get a feeling of the metropolitan life and busy cars and that type of thing, but then they feel even though they know where the river goes, they feel like they're on a quest where they've never been before," Clouse said.